Thailand’s rich cultural heritage and natural beauty come together at Santhiya’s newest address on Natai Beach, situated just 15-20 minutes from Phuket International Airport. The unspoiled beach, one of Thailand’s yet-undiscovered tropical secrets, drapes along the western coast of the mainland in an upscale neighborhood comprising just a handful of exclusive beachfront residences and boutique five-star resorts. The tranquility of the wind-swept beach and endless horizon is captured at Santhiya Phuket Natai Resort & Spa, a collection of 72 private pool villas, each a teakwood sanctuary of holiday bliss. Against this romantic backdrop, couples are enticed to take long undisturbed walks on the beach, interrupted only gentle lapping waves, or indulge in each other’s company over a private candlelit dinner on the beach. Offering sweeping panoramas of the Andaman Sea’s blue hues is the Beach Club, the social heart of the resort and home to restaurants, bars, beach massage pavilions, and a sprawling swimming pool nestled amongst lush landscaping. Two Bedroom Pool Villa is a luxury 350 sq.m. pool villa with 2 large bedrooms which are perfect for a big family. A living and dining area is connected to a giant private swimming pool and a sunken bathtub. 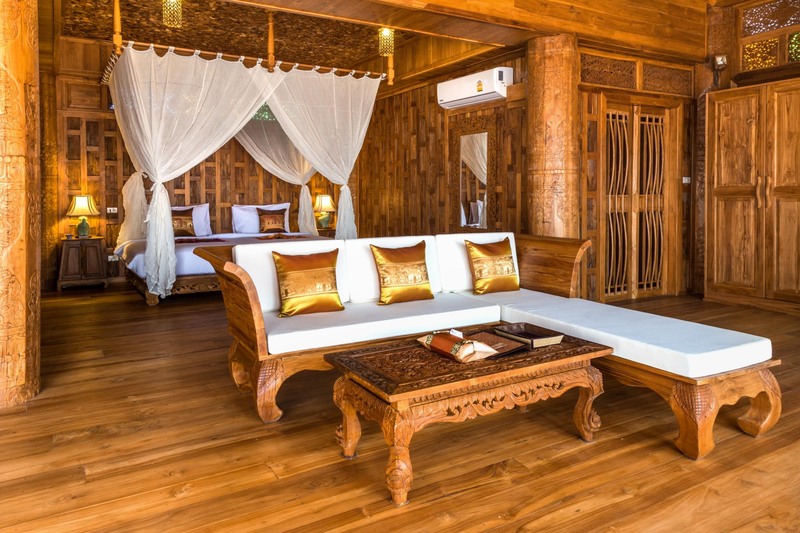 The room is decorated in Santhiya’s unique and traditional design mainly with beautiful teakwood carving. Surrounded by peaceful nature, guests will surely have a perfect relaxation. Hideaway Pool Villa is a 1-bedroom villa with a private swimming pool, outdoor sunken bathtub, a large living room, and a separate dining area with a counter bar. 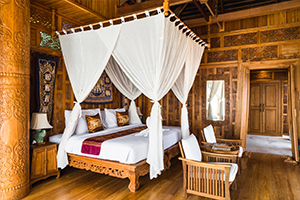 The room is decorated in Santhiya’s unique and traditional design mainly with beautiful teakwood carving. Hideaway Pool Villa offers comfortable stay within a secure private zone surrounded by the tropical garden which you can have an ultimate relaxation. Garden Pool Suite is a 140 sq.m. room which is on the lower level of the 2-story villa with a separate entrance from the upper floor (Deluxe Pool Suite). Garden Pool Suite is perfect for a couple or a small family. Guests can relax in a private swimming pool or outdoor sunken bathtub. The room is decorated with Thai style teakwood carvings and stunning fabrics to create warm interiors that combine oriental ambiance with modern luxury comforts. 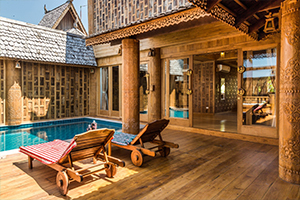 Deluxe Pool Suite is a room type that is on the upper level of the 2-story villa with a separate entrance from the lower one (Garden Pool Suite). Deluxe Pool Suite is perfect for a couple or a small family. With a spacious terrace, a private swimming pool and outdoor sunken bathtub are also available. The room is decorated with Thai style teakwood carvings and stunning fabrics to create warm interiors that combine oriental ambiance with modern luxury comforts.